Did you know that using Sunbrella fabrics with a pop of color can make your outside just as comfortable as the inside? Here are 5 outdoor home decor ideas that will transform your outdoor patio or sunroom into a paradise. Sunbrella Fabrics - Choose the right outdoor fabric. One of the things you'll want to avoid when deciding on the perfect fabric for your outdoor decorating project is cheap fabric. Use durable fabrics made for the outdoors that are easy to clean, provide UV protection, and are water and fade resistant. Sunbrella fabric is probably your best choice for this. Sunbrella fabric is engineered for outdoor durability. Take a look at this video we found that shows just how durable Sunbrella fabrics can be. The company Design2Chill pressure washes a chair that has been sitting outdoors for almost 4 years and had practically never been cleaned! Get creative with your outdoor furniture fabric. Use a mesh on the bottom, so that the water can drain through, as opposed to fabric on both sides. If you're under a patio and it doesn't get direct sunlight, you can actually put two different fabrics on your cushion, one on the front and one on the back, and it gives you two looks for the price one! Protect your outdoor fabric cushions by taking them indoors when you're not using them and definitely never use bleach on them. One of the trends we are seeing in fabric this year, whether it's indoors or outdoors, is the addition of bold color. People are tired of the neutrals and want to see more color. We are seeing a lot of blues and almost any other bold color that matches natures outdoor color scheme. One of our customers re-did their outdoor porch, they screened it in and now they've got an entire living room suite out there! We're talking tables, chairs, sofa, recliners and a flat-screen TV. We know of others that have even gone so far as to put a pizza oven in their outdoor living space. Gone are the days of those old wicker chairs, people are embracing outdoor decor in the same way they approach indoor home decor. 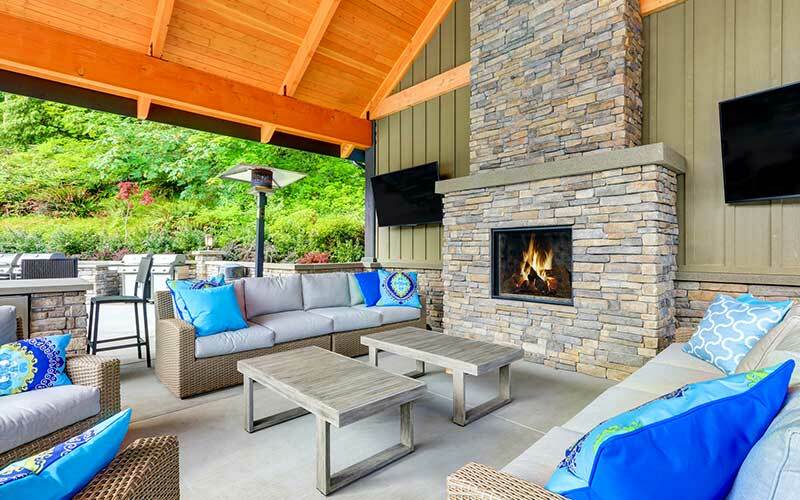 Other outdoor decor trends include things like fireplaces, open pits, bold lighting, swings, and accessories. It appears that this trend for bringing the indoors outdoors isn't going away any time soon. It all starts with great ideas and of course you'll need outdoor fabric like Sunbrella fabrics that are designed for the elements. If you need help coming up with fresh decorating ideas for your outdoor patio, sunroom or deck, feel free to give us a call at 770-421-1278. Yes, a built-in fireplace on the porch or deck is just amazing!